I needed some happy colors today I have cone to the third part of wanting this baby out of me and I still have over a month to go!!! So when I saw the SC I new just what I wanted to do. 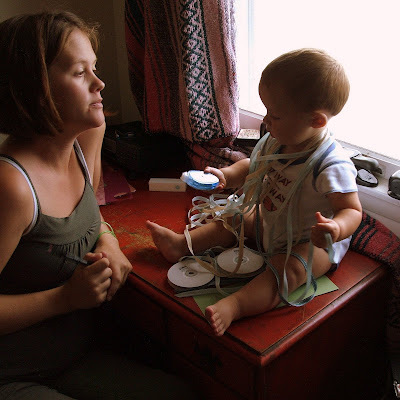 most of the time I have it done a lot sooner than now but man I just could not wake up today I also could not sleep with 2 other toddlers running around so I was a snail getting it done!!! 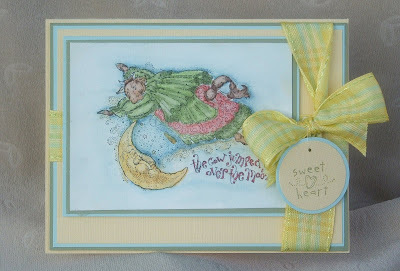 I am pleased with how it turned out and I am kind of happy it took as long as it did it is so much fun to see just how many embellishment I can put on one card!!!! You can't really see the Ric rack but is is what separates The middle DP there is also ribbon and silver cord through the eyelets. 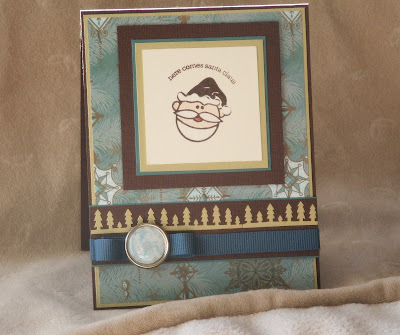 The little gem stone photo corners have been one of my faves and I could not call this card done till it said something christmasy!! well it is kind of a bla layout but with such a big image I kind of blanked out so this is what I came up with. I think I should have st oped and not put brads on. things I really do like are the water coloring my fav way to bring an image to life. I also like the BG stamp I have many of them and never use them till a few days ago. I could not get them to stamp evenly and them it hit me place it on the stamp upside-down and brayer it now I really like the BG stamps!!! I now have a list of new one's that I want. 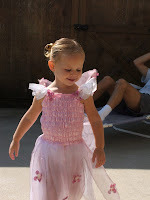 Thank you for stopping by and don't forget that after the first I am going to post my first blog CANDY!!!! I can't wait!!! 3-I am for sure the most judgemental person that I know!!! 5- I hate washing cars what a bummer job to have to do that and unloading the dishwasher before I can clean the kitchen yuck!!! 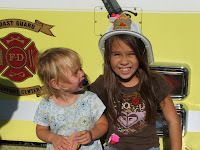 7-now that I am a mommy I think that the holidays are so much more fun I love to see there happy little faces!!! now who do I tag..... I will tell you tomorrow!!!! SC147 Birthday and some small print!!! I Sarah Green do here by promise to not touch this set of stamps for at least one good week........ but you can't call me out if I do!!! I cant help it I love them!!! okay now that I have that out of the way this is for today's SC147 what a great layout I had fun!!! 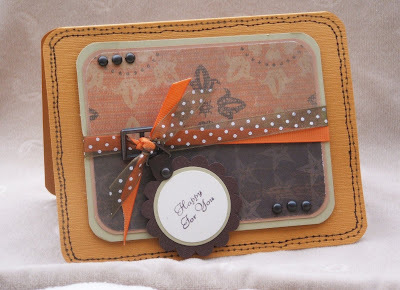 I used choc chip cameo coral my fave river rock and WW!! I pulled out the pretty stones for this one added some gold cord and ribbon and my way cool flowers!!! I have to keep this short today my house is close to being declared a deserter zone so I best get to cleaning before FIMA and the US army show up with relief!!! This is an add on from this morning. I just had to make one more card for today's SC!! Most of the time I only make a second, because I did not like the first one... not the case here, I just really liked the layout. I had some time on my hands after I cleaned the house. The kids have been up from there nap for an hour now, so the house not so clean anymore!!! And I can smell a diaper calling me YUCK!!! I can not believe that I I have over 5000 hits and 50 posts on this little blog already I just want to say a quick thank you to all who hang out here I promise I will do something special for you after the first!!! 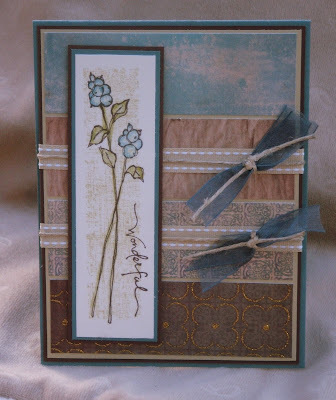 On to the card this is for CC137 what a beautiful challenge Basic gray soft sky and pomegranate I used my new PAPERTREYink stamps and the pretty flowers that I also got from PAPERTREYink, some very simple silver cord and stickles!! and I don't think that I will quit playing with them any time soon. 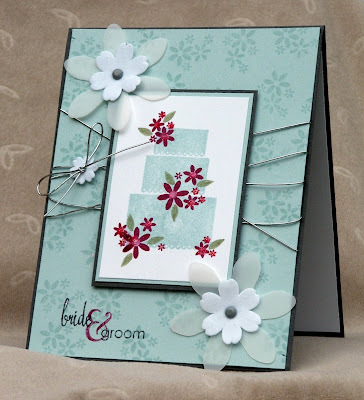 I do not know anybody that is getting married but I had to make a wedding card just for the heck of it!!! I used the new basic gray textured paper pale and perfect plum, and shimmery white! pale and perfect plum and mellow moss for the ink! 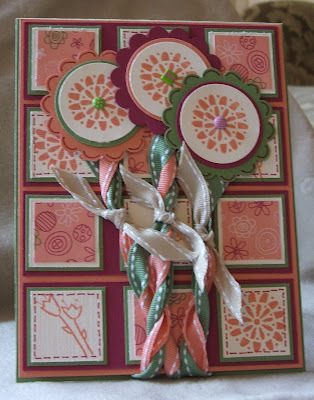 I also used a lot of ribbon flowers brads and a few punches!!! I will be the first to say that I am quite pleased with how it turned out!!! this is the veiw from the back thank you for stopping by!!! New Stamps And A Swap!!! 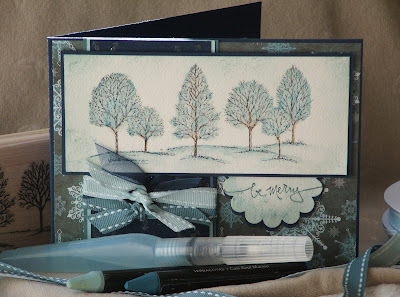 this card just started out with the BG paper I just wanted to play and see how well my new stamps stamped out, because to me paper tray stamps felt different than other clear stamps! I also thought that they stamped out better than other clear stamps. so I just grabbed any-ole color off of my shelf and and I prepped and inked them up I had not real intentions of making a card last night I think if I had I would not have picked the colors that I did. I am so happy this happened by accident I think things turn out so much better when you don't over think them!!! the colors used are summer sun garden green and shimmery white with a touch of pomegranate, like I said just playing but I think they all kind of went together well!!! this is a picture of the back. 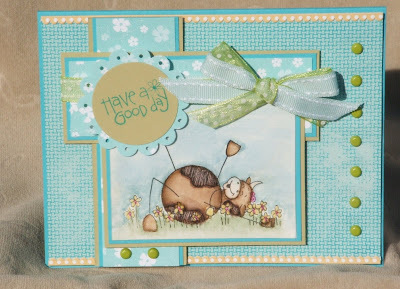 I am so telling you that when I said I did not sit down to make a card I really didn't and this is the first card that I have finished in a really long time front back and inside are all done and it only took about a half an hour!!! 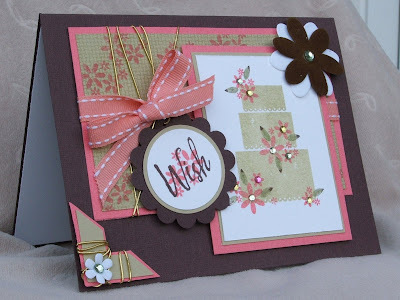 this is not a very good picture of this card and I am not sure this is the card I want to use for my swap, I do know that if I do use it that I will not put the glitter glue dots on it they don't match and they took WAY to long to dry!! 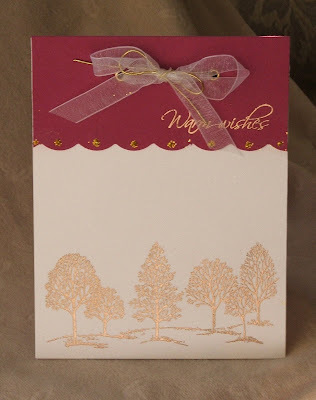 All of the stamping is done in VM and heat embossed in gold on shimmery white and pomegranate and tied off with ribbon! 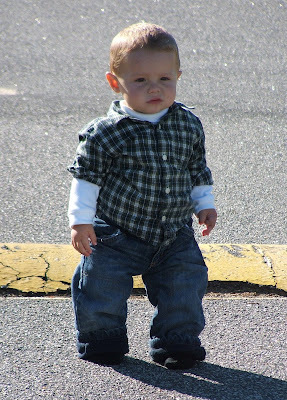 Now I want to show you how cute my little man is getting he just looks like the cool football player in this picture!!!! Please don't get me wrong I love all three of these beautiful babies, but when they have all been sick off and on for the past month....... I am at the end of my rope!!!!! For real if I have the clean up any more body dropping from one end or the other from any of my kids and that will be it, I will brake down and just cry! I am so frustrated that I cant even do the SCS challenges and have them turn out the way I want them to!!! I did WT136 and I am so not happy with it I wanted to make something that looked like a drift wood frame and what was in my head just did not come out on paper. 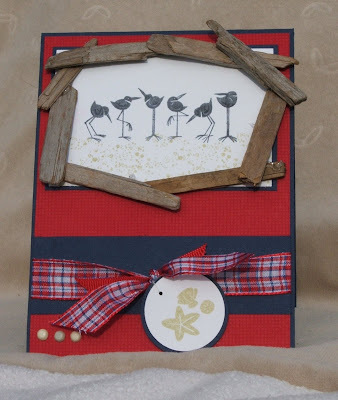 I used shore thing and canvas for the stamps real red and night of navy and WW for the paper and basic gray and river rock for the ink and finished it off the ribbon and mulch from the park for the drift wood look!!! I think I may think twice before I try one of the "Dirty Dozen" sketches again It has been a long time since I have made a card that took all day, this one just really puzzled me but I am really pleased with how it turned out!!! this started last night when I remembered that I had got the cow stamps from MissyB, and then once again forgot about them and never used them so I got up this morning and stamped my cute Little cow out on watercolor paper! she is colored with my trusty SU markers and blended with my aqua painter what fun she is to color!!!! It just all kind of came together from there! I did not have any brads that matched so I thought if I put a LOT of them they it would look like I meant for them to not match it is really okay I don't think they look that bad!!! LOTS of brads and some ribbon to top it off!!!! This is a post script so many people have asked how I did the shading so I will add it. 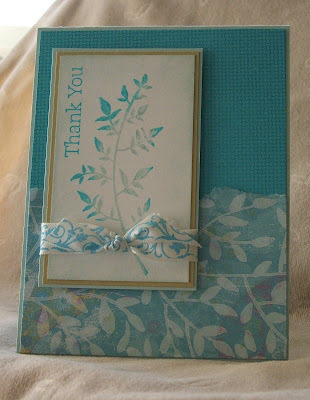 On both of the stems on both cards are "rocked and rolled" and I wanted to say thank you to "miss stampin when I can"http://stampinwhenican.blogspot.com/ for linking me on her blog it made me feel special!!! and then I remembered that I had some really cute yellow ribbon that had not been open! thanks for stopping by please tell me what you think!!! 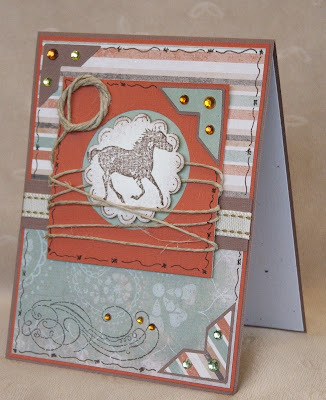 This is my second card for this challenge and I am way happier with this one the other one was just not good it is in my SCS gallery if you really want to see it but I got to go for now late for my doctors Appt.!!!! for the details I said I would update, here they are!! 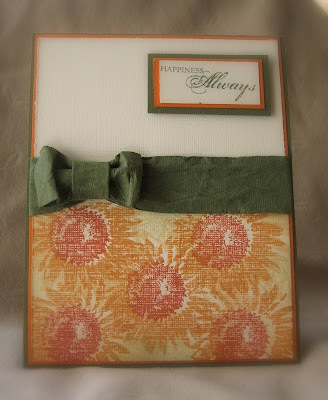 Stamps are SU sunflower 2 step set. Love that set of stamps I should use them more! 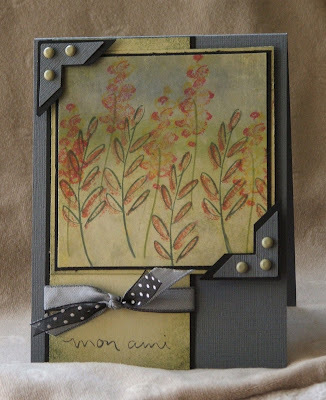 The ink is so saffron for the bottom layer of the flowers, and more mustard for thetop layer. Center is really rust as are the bees. For the leaves are stamped in river rock then rolled in always artichoke and popped up on dimensional. 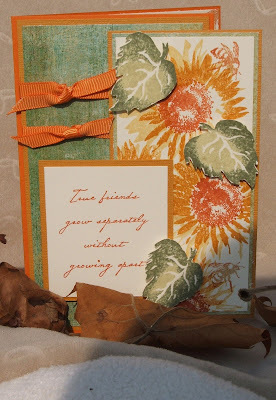 the paper and card stock are pumpkin pie more mustard, VV, and some old basic grey DP I have had forever!!! the ribbon is SU pumpkin pie. The inside border that you unfortunately can't see is stamped with the same leaves and bees thank you for waiting for the rest of this post! 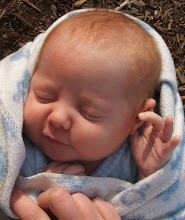 as for the doctor every thing went great at only 12 weeks to go. it is sneaking up on me way to fast!!!! Just to let every body out there know sunflowers are my fav flower!!! I have had this card in my mind for awhile now and it all just kind of came together today I knew what I wanted and the CC was perfect!! I am sorry for cheating and adding red but come on this card needed it. this card is brayered sponged and smeared and I am so happy with the way it turned out TFL!!!! "this is the second time I uploaded this and that makes me sad there where some really funny comments!!!! 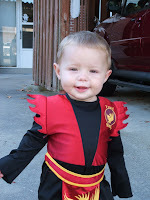 but yes this is Henry with 45 yards of in color ribbon around him and this happened on daddy's watch!!!" I only have a min.or two to wight this but I felt that all of the stampers out there needed to see what my boy had done what a turd right, also a great photo opp. 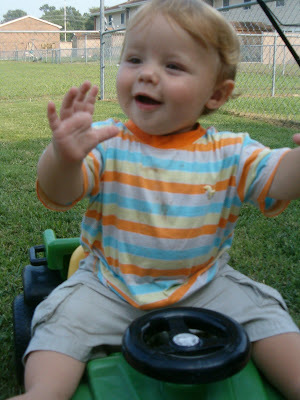 This is Henry and he is who I call little mister do no wrong (yeah right)... he is a very sweet little guy but he has some really sticky fingers!!! the card is for today's IC challenge and a little girls Birthday party that I should be at now so I don't have to much time to tell you all the details the one thing I can tell you is the stamps used I got for $1 every thing else is SP!!! thanks for looking!!! 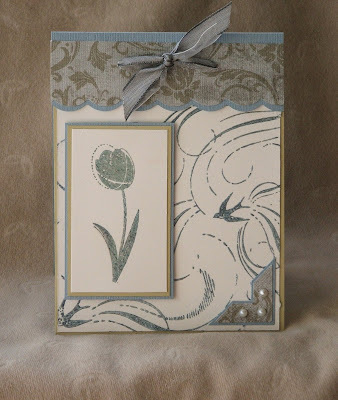 there are a few thing that I love when it comes to card making and "Oh, so lovely" is one of them I also the new textured paper and in color mostly River Rock The one color that I liked the least when I first saw them all, go figure. Any-whoo I was looking through my fave blogs to be inspired, and it did not take long! 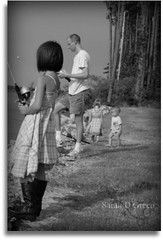 Nicole Heady over at capture the moment http://nicholeheady.typepad.com/capture_the_moment/ she is always good for simple but beautiful ideas. 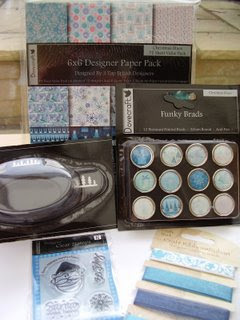 This time when I logged on to her blog she had some stuff about digital scrap booking and card making all stuff I know nothing about! 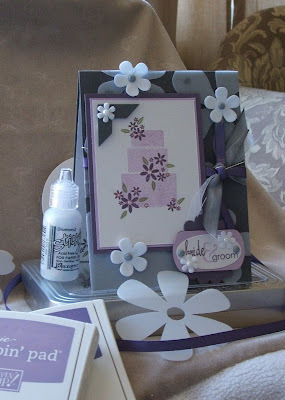 All I do know is that I loved the DP she had used one her sample card so I went to the link Nicole had provided and downloaded the free download link that was there and simply printed off my own DP on my confetti cream card stock it could not have turned out better! then I was to lazy to go up stairs and find new colors to use so I used what I had down stairs already stamps ink paper the whole 9 yards the only thing I did go up for was the Martha Stuart ribbon the leaves on it kind of look like the leaves on my self printed DP. 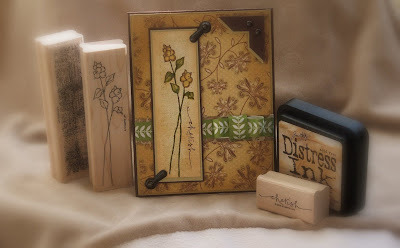 And now I have to make myself a promise and that is to put Oh,so lovely away and lay off of the Christmas cards my only problem is that I really don't want to but then again I don't wand use them till I hate the either ohm well we will see what happens. Now for the rest of the info on the card. 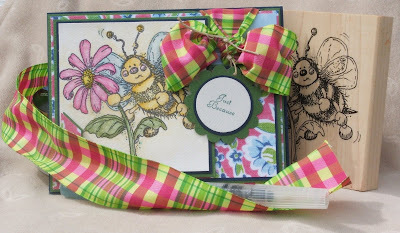 Martha and walmart ribbon Conner punch choc chip river rock timber brown distress ink SU markers printed off DP and HPH!!! thank you so much for looking stop by again!!!! 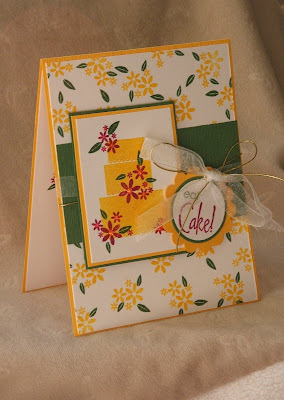 this is for today's LSC 136 kind of fun no fuss card making, but I still made a huge mess all over my table! So that it did not look to flat that I would put as much texture as I could and I did that with my not so real stitching, textured paper and 4 layers. 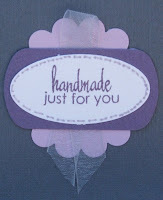 The little tag was made a few days ago for a different card but is ended up being way to much for that card. So today I have not touched even one stamp that being said I also don't think that I am done playing for the day. I think that Ava is finally feeling a little better still kind of slow but more like her stubborn self today she even wanted to eat a little bit when she woke up not much but it is way better than nothing. Henry however is still not felling so hot but he is up and playing unlike yesterday he just layered on the floor all day. We are still keeping his food pretty dry today I just hope he keeps more down today than he did yesterday. All in all today has already started out much better than the last two nobody body has spilled out all over my house beds and cloths lets hope it stays that way!!! thanks for looking today hope you like what you see!!! 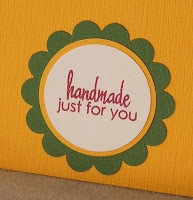 I don't think that I will be getting much card making, or house cleaning done today. Two of my three babies are sick. I keep waiting for the phone to ring and tell me to come pick Jasmine up from school. It is not even 9:am and Henry has had to baths to wash puke off of him and I have changed his bedding two days in a row I am so sick of laundry, what is a Mommy to do!!!! 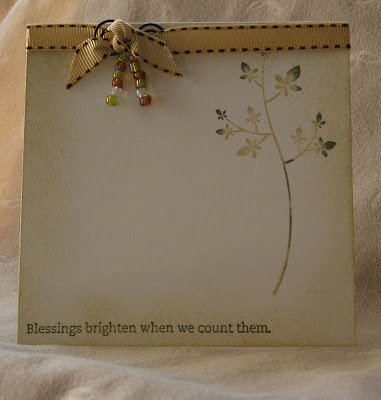 I might get a card done today some were around nap time so look for that.......... and I am off to do my 5 loads of laundry!!!! and some time today I wanted to watch my shows that are waiting to be seen in my DVR there is just never enough time in the day!!!! I sat and looked at the SC for a long time this morning and nothing was coming to mind except that I wanted to watercolor so I went to my room and rummaged through my card stock and chose two colors that had never been open and it just came together from there!!! I do think that I am going to need somebody to come to my house and lock up all of my Christmas stamps I just can't seem to get off the Christmas kick they are just so much fun!!! alright I have truly got to clean my house now it is in Major need and the DH is getting peeved, maybe he should get over it after all he is the one that told me to get a hobby so I did!!! TFL please let me know what you think!!!!! 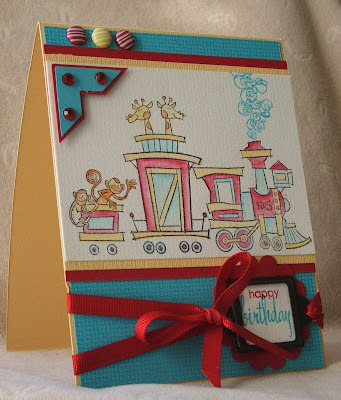 there is not much to say about this card, it is a case of a card I made a few days ago. I used today's color challenge. 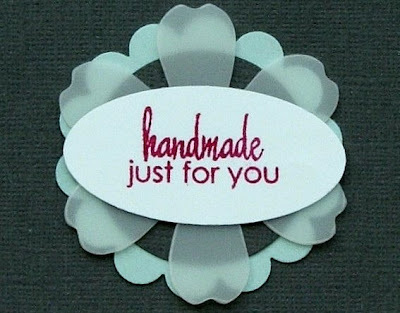 I made 5 of them for a small gift set with the holidays coming up very quickly I think I will need a bunch more!!!! 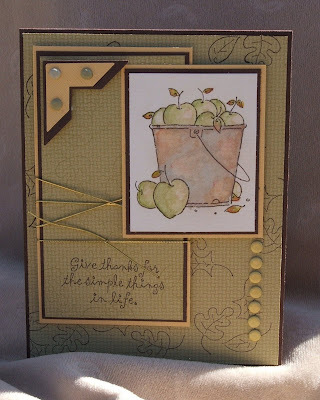 this is the first card I made with my blog-candy winnings and for today's color challenge. 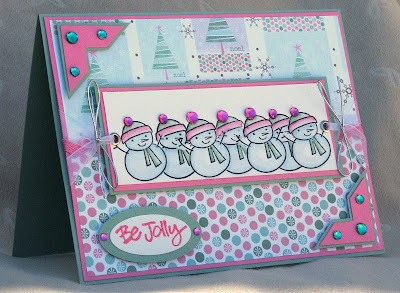 The DP stamp, Christmas tree border and brad all came from Jenny over at stampin moments http://stampingmoments.blogspot.com/ go see her great work !!!!!! look what I got in the mail yesterday I was so excited that I opened every thing right up before I even thought to take a picture so I just went on over to Jenny's blog http://stampingmoments.blogspot.com/ Stamping Moments and copied her picture thanks Jenny you have been great and I have loved talking to you through e-mail!!!!! I thing I will get another set of Christmas cards and then some out of all this and I love the paper it is kind of heavy DP it makes for a stronger card! again thank you Jenny!!!! !